A declaration to this effect was read by two of their representatives—Bishop Fernando Ramos, secretary general of the conference, and Bishop Juan Ignacio Gonzalez of the diocese of San Bernardo—at a press conference in Rome, May 18. It came at the end of a three-day summit of “discernment” led by Pope Francis. 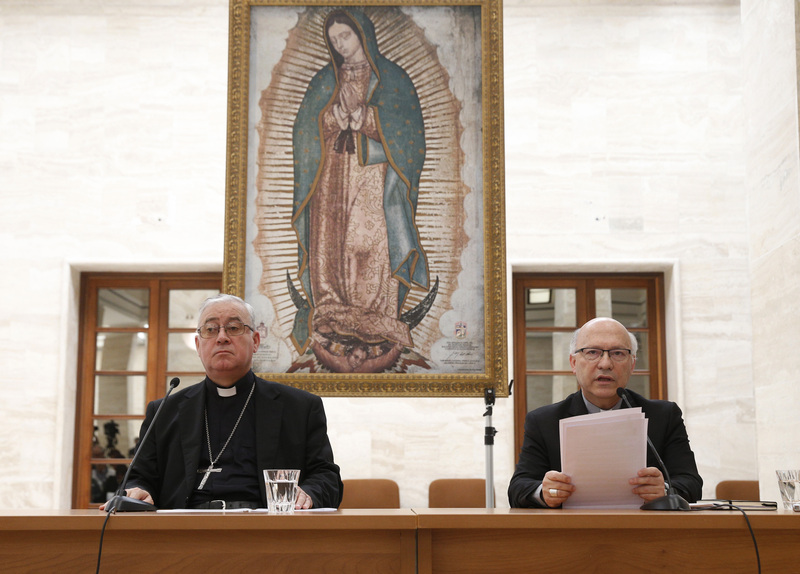 On the first day, May 15, he read a 10-page document to them which he had prepared that offered his diagnosis of the crisis in the Chilean church, based on the report from Archbishop Charles Scicluna and Msgr. Jordi Bertomeu, whom he has sent to Chile “to listen to the victims.” Francis gave each of the bishop a copy of that text and asked them to “reflect and pray” on it. On the following two days each of the bishops spoke from the heart, in a spirit of dialogue. And then the bishops decided on the steps they should take, which they outlined in this declaration. With initial reporting from Catholic News Service. This story has been updated. Viva Papa Francisco! He is the hope of our Church as led by the Holy Spirit. Estamos orando por ti Santo Padre! To be truly valid many of the resignations will have to be accepted. High levels of mia culpa style theatrics are unacceptable. My hope and prayer is for the possibility of TRUE men of faith rising up to guide the flock and not in the continuation of disconnected and so-called leaders i.e. The Princes of the Church. Pope Benedict to live a life of penance as should Francis. and lives a life of Penance along with Benedict. Church but for all secular institutions which have harmed or colluded in harming individuals. Ave Maria! I can't wait to hear the response of the 3 Chilean victims who met with Francis first, last week. Could this be the phoenix (holy spirit) rising from the ashes of the Chilean Church? Fantastic! This is what the whited sepulchres who run Catholic Church, Inc. in the U.S. should have done in early 2002, after their Rome meeting with Saint Pope John Paul II. Jeffrey More: Essentially my first thought, too. As for contrition, I sincerely doubt there is such. They did the right thing, unlike Roger Mahony and other ego-driven U.S. bishops. Amen to Pope Francis for going after the sins in our church, financial abuse and sexual abuse. His message of inclusion of all people is welcomed. The challenge is to bring back young people into our Church.